As a native of small town Crofton, MD, Frank began his career as a professional photographer just before completing his formal art education in summer of 2010. With little opportunity in the area for fashion oriented work in the immediate area, Frank dived headfirst into the high-end wedding and contemporary portrait market which quickly turned into a full-time career. Frank spent almost all of his free time continuing his passion for fashion and commercial photography working with personally-hired models, stylists, and studios to build his portfolio. In the fall of 2013, Frank relocated to the Turks and Caicos islands to pursue destination wedding photography, commercial lifestyle imagery, and advertising campaigns for 5 star resorts. Over the four years of his residence, Frank's vision and technical prowess for photography quickly developed, as did his publications and notoriety. Frank's work in the luxury wedding and advertorial arena has now been published in dozens of magazines, websites, seen on billboards, and appeared in newspapers internationally. Frank's talents have been sought after by hundreds of individuals in the Caribbean and beyond and will soon be readily available for hire in the greater area of Manhattan. 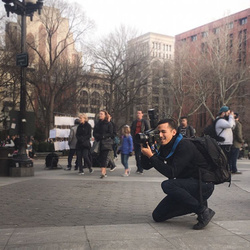 Frank is also avidly passionate about helping other photographers and students that need it, and always has availability and educational opportunities for young students and interns of all skill-levels.